There are groups of cocktails such as Collins, Punches, Sours, Slings, Cobblers, Shrubs, Toddies, Flips and Fizzes. The Gin Fizz is probably one of the most ordered and popular of the fizz category, being a simple mix of gin, lemon juice, sugar and some carbonated liquid (club soda). 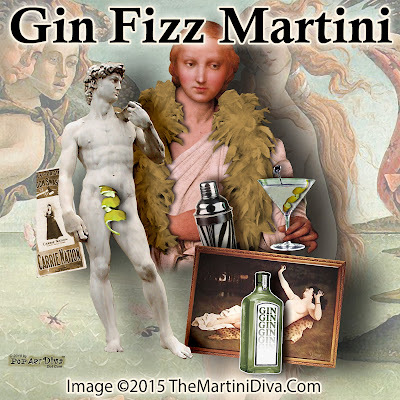 A Fizz is basically a sour with some fizzy topper added to the mix and is classically served in a tall Collins glass. Here we use a martin glass and just less of the soda, making it a more powerful drink - as martinis usually are! This was a very popular in the fifties and early sixties and is very much like a Tom Collins which uses Old Tom Gin, a sweetened version of London Dry Gin. The Gin Fizz is usually garnished with a Maraschino cherry and a slice or twist of of lemon but you can always have some fun and add a little "fizz" of your own with a candied lemon slice, a cherry flavored candy or even lemon drops!